Citation Information: J Clin Invest. 2012;122(8):2898-2910. https://doi.org/10.1172/JCI63103. Squamous cell carcinomas (SCCs) are heterogeneous and aggressive skin tumors for which innovative, targeted therapies are needed. Here, we identify a p53/TACE pathway that is negatively regulated by FOS and show that the FOS/p53/TACE axis suppresses SCC by inducing differentiation. We found that epidermal Fos deletion in mouse tumor models or pharmacological FOS/AP-1 inhibition in human SCC cell lines induced p53 expression. Epidermal cell differentiation and skin tumor suppression were caused by a p53-dependent transcriptional activation of the metalloprotease TACE/ADAM17 (TNF-α–converting enzyme), a previously unknown p53 target gene that was required for NOTCH1 activation. Although half of cutaneous human SCCs display p53-inactivating mutations, restoring p53/TACE activity in mouse and human skin SCCs induced tumor cell differentiation independently of the p53 status. We propose FOS/AP-1 inhibition or p53/TACE reactivating strategies as differentiation-inducing therapies for SCCs. Fos epidermal deletion in mice suppresses skin cancer development due to increased differentiation. (A) Papilloma macroscopic view in 6-week-old mice deficient for Fos in the epidermis (K5-SOS+) compared with controls. Relative tumor volume is shown in 6-week-old mice (n = 10). (B) Papilloma size average per mouse and numbers of papillomas per mouse upon DMBA/TPA throughout 15 weeks in mice deficient for Fos in the epidermis (K5-SOS+) (black bars) compared with littermate controls (white bars). n = 7 per genotype. (C) Immunohistochemistry of 4-week-old mice deficient for Fos in the epidermis (K5-SOS+) (lower panels) compared with K5-SOS+ controls (upper panels) demonstrates increased expression of Keratin 1, Keratin 10, and Involucrin, Filaggrin, and Loricrin keratinocyte differentiation markers. Arrowheads indicate positive staining. Scale bar: 100 μm. Original magnification, ×10. (D) qRT-PCR analyses of tumor samples from 4-week-old mice deficient for Fos in the epidermis (K5-SOS+) compared with controls. Increased expression of p53, Notch1, and TACE in mice lacking epidermal Fos. n = 4 per genotype. (E) Western blot from 4-week-old mice deficient for Fos in the epidermis (K5-SOS+) compared with controls. 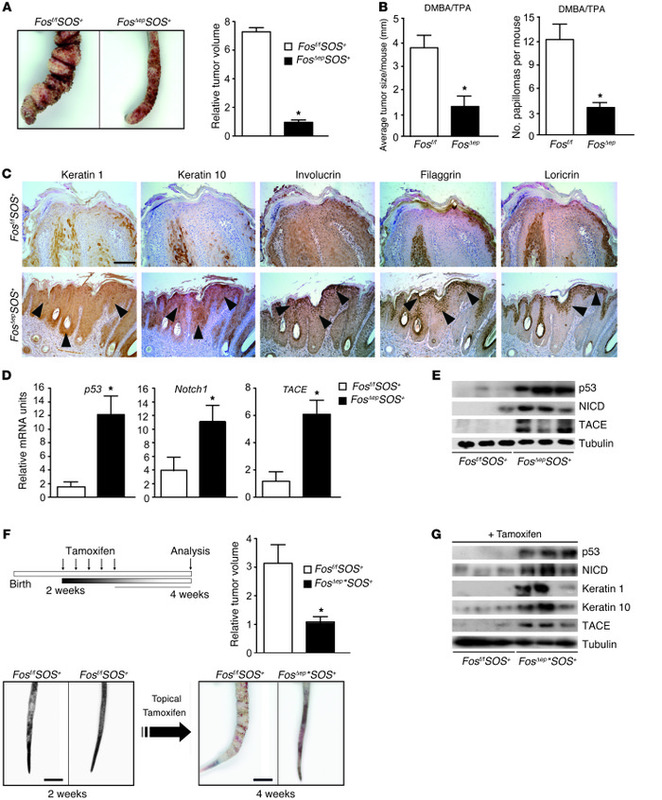 Increased expression of p53, NICD, and TACE in K5-SOS+ mice lacking epidermal Fos. (F) Tamoxifen application in 2-week-old mice and analysis 2 weeks later. Relative tumor volume is shown in 4-week-old mice (black bars) compared with controls (white bars), demonstrating reduced papilloma size upon inducible, epidermal Fos deletion (upper panels). Macroscopic appearance of papillomas before and after inducible epidermal Fos deletion (lower panels). n = 5 per genotype. Scale bar: 0.5 cm. *P < 0.05. (G) Western blot analyses of tumor samples from inducible Fos-deficient K5-SOS+ mice. Results show increased expression of p53, NICD, Keratin 1, Keratin 10, and TACE.